You can be surprised by what a New Yorker will be proud of. When I asked my temporary officemates here what I should do for an evening, neither of them recommended a show, restaurant or the usual whatnot we associate with the city. They both insisted that I go walk the High Line. So I did a little research. 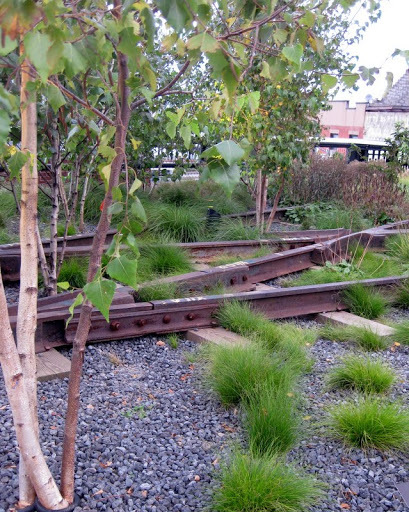 The High Line is New York’s newest park, and unquestionably its most unusual. It consists of about a mile of elevated train track winding through lower Chelsea on the west side. It was built in the 1930s, during that span when civilization was in the thrall of steel and iron industrialism. It fell out of use with the city’s decline 40 years later and was abandoned as is, a sort of monument to an era past. 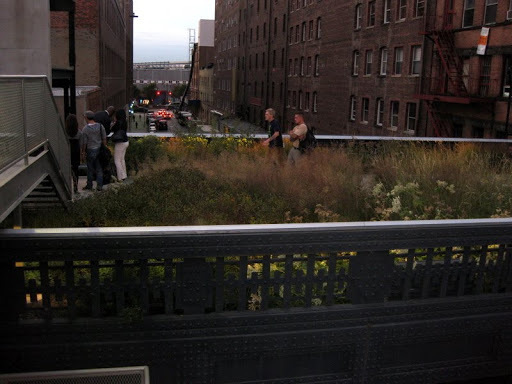 About 15 years ago urban explorers, tantalized by the lure of uncharted territory, discovered that while the city had forgotten the High Line, nature had rediscovered it. The gravel beds along the abandoned tracks had blossomed into a unique habitat of trees, wildflowers and grasslands. 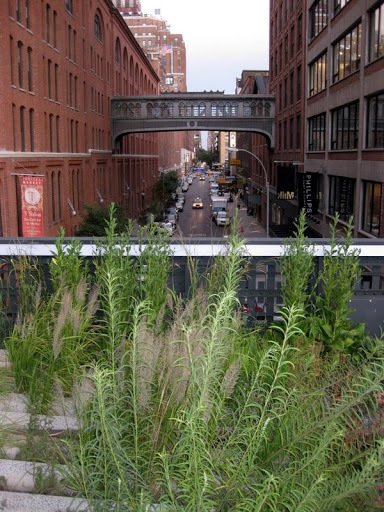 And when the city’s redevelopment programs set plans to tear down the “blight” of the abandoned railway trestles, the explorers rallied behind a counter-proposal to turn the High Line into a park. They won. In 2005, the city committed $50 million to the project, and this past June, the first section opened to the public, an incongruous testament to the power of nature. Anyhow. It sounded good, so off to the High Line I went. And found it surprisingly soothing. The city did a good job, really. They didn’t pave the area with a manicured lawn, asphalt walkways and jungle gyms. No, they put in a path, but it meanders through the gravel bed and tracks left as they were, overgrown with fennel and sage and bob-knows-what. The feeling is one of time travel, to a point somewhere after man has left the city for good, and nature has set up house in his wake. It’s like a reverse diorama, even. Rather than standing in our modern world, looking through the window at some representation of another place and time, on the High Line we stroll through that place and time, as large as life, looking outward and down past the guard rails at a world we have, for the moment, left behind. Below, the city streets teemed. On either side, aging warehouses – the urban sequoias of this landscape – rose to meet us three stories up, then reached skyward beyond us. The sun bedded down into a nest of clouds across the western horizon, bathing north New Jersey and the river in colors worthy of Turner (J.M.W., not Ted). Painters painted, old friends chatted, and young lovers… well, they necked gratuituously, the way young lovers always seem to do in public places. But it was okay, the way these things are always okay, once you remember that long ago, you would’ve done exactly the same thing. The sun had set by the time I’d made it to the northern terminus of the park and descended back into the modern world of city streets. The noise – it was strange how the noise felt so much more immediate at street level – the noise billowed over me like a snowstorm. But the sensation was like one I remembered from stepping out of a warm libraries into a Dartmouth midnight blizzard. The heat you’ve absorbed from sitting fireside in your studies give you some reserve against the storm, and the cold can’t touch you. It doesn’t last forever, but if you don’t dawdle, it can keep you for the 5 or 10 minutes it takes to scurry across the ice-laden paths back to the shelter of your dorm. So it was with my time warmed by the calm amid wildflowers on the High Line. As I tromped the way back to the Chelsea flat, my blissful smile was invulnerable to the grime, swirling street crowd and angry rush hour horns (no, they weren’t honking at me). If the High Line can do that to even a small fraction of the stressed out denizens of this city, my officemates were right: New York does have something to be proud of.